I have always wanted a white kitchen. I’m not exactly sure why, but there’s something about the way white cupboards remind me of fresh, crisp sheets or just done laundry… The kitchens just seem… clean. 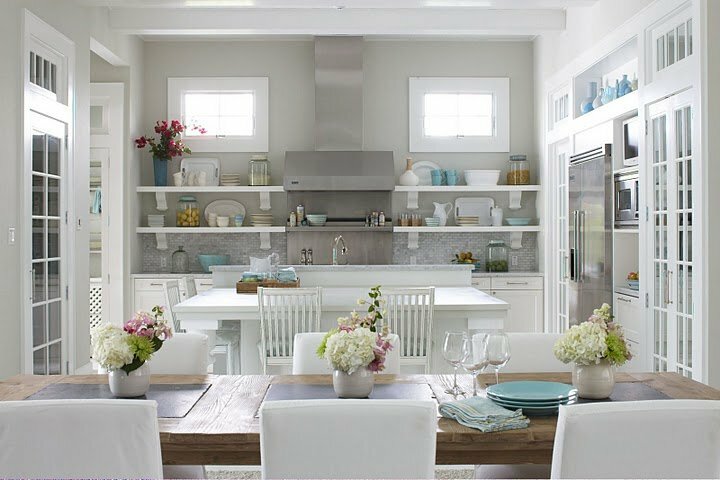 It also might be the fact that these tasteful galleys have beautiful islands and space saving cupboards, which naturally brings out the Virgo/organization enthusiast. I can't lie, I love order! White kitchens came into popularity in the 90’s, and functionality and light were key. 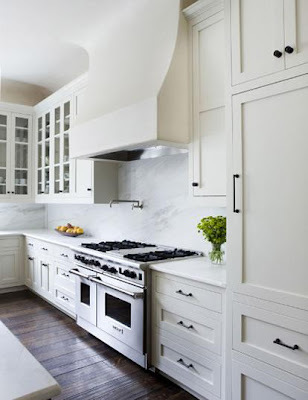 Look at all the white kitchens you have seen in magazines or movies. They are always accompanied with rows of windows or French doors. So I have begged my husband to please allow me to have a white kitchen in our next home (which I hope to one day share with you). But for now, feast your eyes on these beauties! Wow, those are all beautiful. Makes me think I'd better go clean my kitchen! I LOVE white kitchens. When I have my own home, I want to do something like the photos you just posted! Thank you for assembling this great collection of white kitchen photos! I love these. They are persuading me to go with a white marble top rather than the serpentine marble or green soapstone. My husband thinks the white on white looks too clinical, so how do I persuade him? I personally love the white marble as well! I think the key to not making white on white too "clinical" (funny husbands ;) is the floor. If you add a contrasting floor it helps give the room depth and texture. I prefer dark wood or a similar substitutes. Also, it's important to have a few key accessories. Green or another neutral work very well. Good luck with your remodel! There's nothing more fun. Wow! The kitchen looks awesome. The white color adds an extra attention too. I just loved it. Keep up the good work.